Where is White Gumba (Seto Gumba) ? White Gumba (Seto Gumba) Located in the midst of vivid terrain and lush GREEN valley Seto Gumba (Druk Amitabh Mountain) or white monastery is a heaven to witness the sunrise and sunset. Just located in the outskirts of the valley Seto Gumba is a panoramic kaleidoscope of colors and rich culture that showcases the valley in the most spectacular way. Looking at it from a traveler’s point of view Seto Gumba is bliss of astounding natural rejuvenation that searches excitement as well as calmness. White Gumba (Seto Gumba) Located in the midst of vivid terrain and lush GREEN valley Seto Gumba (Druk Amitabh Mountain) or white monastery is a heaven to witness the sunrise and sunset. Just located in the outskirts of the valley Seto Gumba is a panoramic kaleidoscope of colors and rich culture that showcases the valley in the most spectacular way. Looking at it from a traveler’s point of view Seto Gumba is bliss of astounding natural rejuvenation that searches excitement as well as calmness. Endorsed with a rich Tibetan culture and architecture, it splurges vivid colors in the murals, statue and paintings professing Buddhism and its techniques. One can get nostalgic in the presence of finding and seeing the explicit environment that melds you in its presence. Winds shouting out loud the music of scenic views and panoramic existence makes you think of what life and you will lose time in absence. Once you get here you will be abided by the smell, sounds and prayer flags that spread around the message of peace, patience, and calmness. The more interesting are the visuals that overlook the valley in a synchronizing way of contouring the old cultural heritage with the increasing encroachment of the concrete jungle. 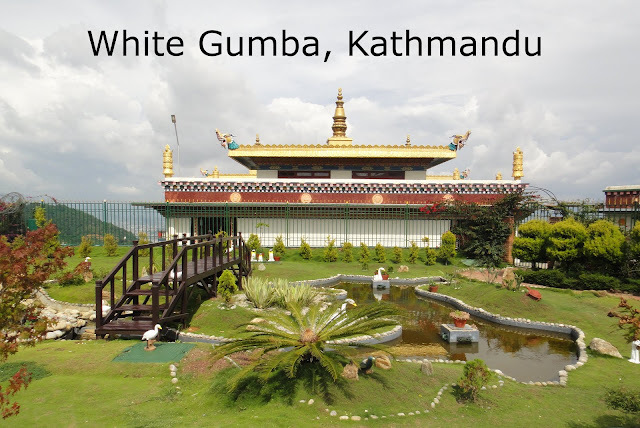 Situated at the top, white gumba is located at very beautiful place from where nice scenery of Kathmandu valley can be seen. How to reach White Gumba? You can start your trip from two different locations according to your ease. One is from halchowk and another one from sitapaila. If you are going on public vehicle you have to walk from a junction of ramkot and white gumba. Or, if you have your own vehicle then you can take it straight up to the white gumba. As it is located at up-hill, we suggest you to take a vehicle which is in good condition because the way to monastery is very steepy which is little bit dangerous. You can go on bikes and cars but scooters are not so much suggested to take there. Anyone who is looking forward to go on hike can also opt for white gumba. How long does it take to reach White Gumba? On Bike from Hallchowk or Sitapaila it will take only 20-30 minutes. If you have your own vehicle then you have to park it in the parking area of monastery as suggested by the guards. A token slip is provide to you for parking purpose which cost Nepalese rupees ten only. No other fees and charges are taken to visit the monastery. Upon Entering inside they will provide you visiting PASS which you have to wear during the visit of Monastry and which must be return back when you are leaving. It's compulsary to take that pass. You don't have pay a single penny to visit the monastory. It's free for everyone. You can find 1 cafe and two refreshment house indise the Gumba. Also outside the Gumba there are few restaurants as well. - Photography inside the main temple is not allowed. - Entering into the restricted areas are strictly prohibited. - Littering here and there a great stupidity. - Alcohol and smoking is strictly prohibited. - Outside foods and beverages are not entertained inside the monastery. - Respectful behaviour and attire should be maintained. - Entry fee for white gumba is free to not only Neplese its free for all tourist as well. Tourism in Nepal, Trekking Nepal, Rafting Nepal, Nepal Tour, Nepal Travel: Where is White Gumba (Seto Gumba) ?